Figure from WSJ here detailing the sources of radiation exposure in the United States. Today the Wall Street Journal published an article here regarding the tracking of cumulative radiation exposure to patients. This issue has come to the forefront in radiology over the last 5 years given the rapidly increasing volume of CT scans performed over the last 10-15 years. Graph illustrates the percentage of patient visits to the ED receiving a CT scan, which had increased almost 500% from 1995-2007. Graph source here. The data show that clinicians have increasingly ordered more CT than they did in the past. 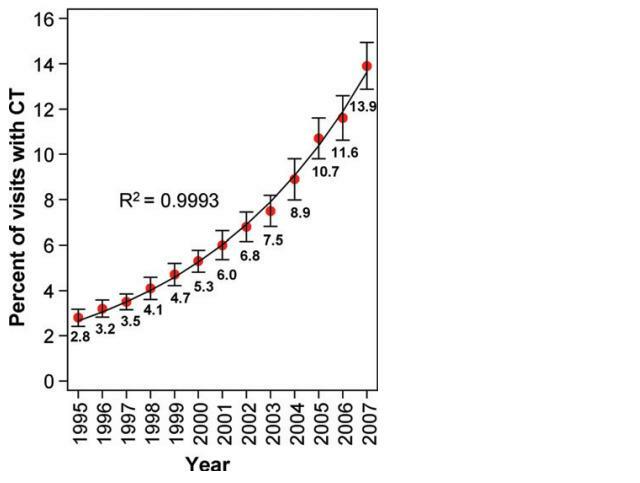 Above is a graph from Radiology showing this data; however, in recent years there has been a slowing of the growth in CT scans performed as commented on in the Wall Street Journal article. The most important point concerning this topic is that each and every test that is ordered needs to be evaluated for its appropriateness for the clinical picture, which has already been addressed by the American College of Radiology Appropriateness Criteria here. If clinicians are unaware of the appropriate test to order, they should consult their radiologists. The best way to get the most appropriate test ordered is to provide a clear, concise, relevant and accurate history to the radiologist. Read a related abstract here from a study I worked on in 2008 and 2009 regarding the use of Low Dose Computed Tomography for diagnosing distal ureteral stones.